Cream cleansers are a staple in my skincare routine. In fact, I always have several on the go and I finish them up so regularly (hence that some of my favourites from this post aren't actually pictured, if I still did empties, they would all 100% be included). My skin is dry/dehydrated and sometimes on the sensitive side and each of these have been perfect for it, though I have recommended each of these to people of all skin types and they have been great too. Just as a heads up, I usually use the Garnier Micellar Cleansing Water, £4.99 to take off all of my makeup first and then I go in with one of these, though they are super effective at removing makeup too - so use this post however it would naturally fit into your routine. The Sanctuary Spa Polishing Hot Cloth Cleanser, £10 is actually one that came into my life very recently. I have loved Sanctuary Spa products for years but hadn't really dipped my toe into their pool of skincare products. As the most budget friendly product of the post, this one definitely doesn't disappoint. A gentle cleanser using beeswax, cocoa butter, coconut and jojoba oil and soothing camomile - and it comes with a handy muslin cloth to buff everything away. The Liz Earle Cleanse and Polish Hot Cloth Cleanser, £16 (for the starter pack) was the product that got me obsessed with this type of cleanser. In fact, if you go back to 2012 (when I first started this blog!) this cleanser was actually my second ever review (head here to see it) and it has featured on here regularly since. It's a beautiful gentle cleanser that removes dirt and makeup, hydrates the skin subtly and leaves skin feeling clean but not stripped. The starter pack comes with a 100ml pump bottle of the cleanser and two muslin cloths. This is always the set I pick up as their cloths are my all-time-favourite. In fact, I have just ran out if yet another bottle of this hence why it isn't pictured. I think a trip to Boots may just been in order as writing about this, makes me miss it. If you buy any of these, buy this one first - it'll change your cleansing life. I remember the first time I tried this. I had always heard incredible things about Aurelia Skincare but had feared spending the money and being disappointed, but if anything I was blown away and completely understood the expenditure. The Aurelia Probiotic Skincare Miracle Cleanser, £42 has been one of my favourites since I first tried it. It is incredibly luxurious, from the pretty packaging (which gets me every time) to the way the product feels on the skin. It works similarly to the other products in the feature as it's applied and buffed away by one of their gorgeous muslin cloths - but this one really makes my skin glow. 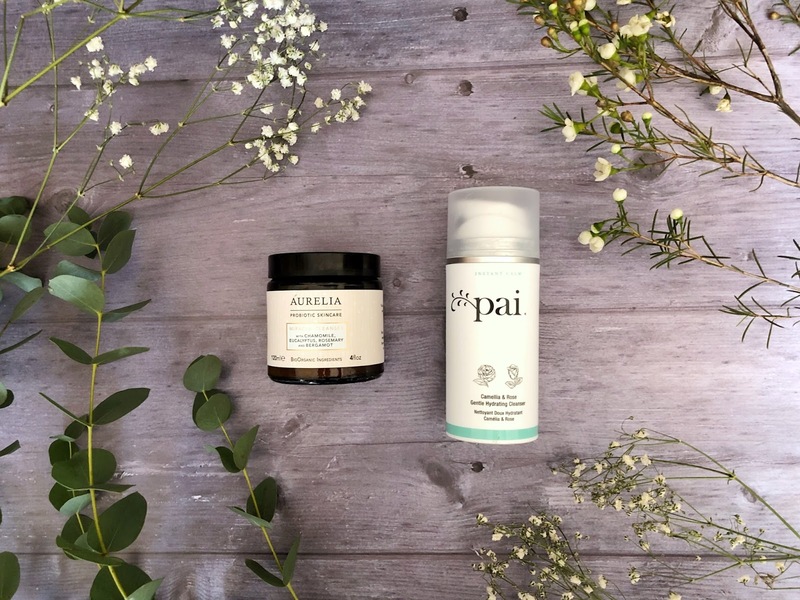 Although it is formulated for sensitive skin, I usually opt for the Pai cleanser as it;s a little more gentle, but if my skin needs a pick-me-up this is the one I go for. Have you tried any cream cleansers? Let me know your favourites!